Disease Detection Gets A Boost With Plans For A CDC In Africa : Goats and Soda African health officials are partnering with the U.S. to build a continentwide Centers for Disease Control and Prevention. The goal is a more rapid response to health emergencies, such as Ebola. 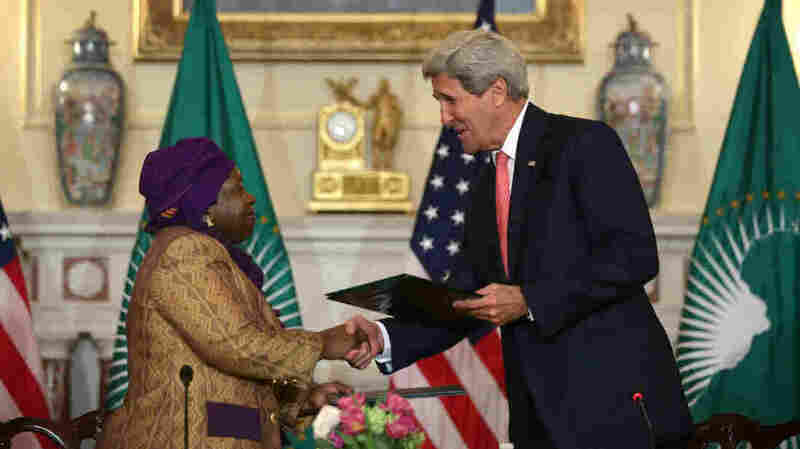 Secretary of State John Kerry and African Union Commission Chairperson Nkosazana Dlamini Zuma signed an agreement Monday to establish the first Centers for Disease Control and Prevention in Africa. The U.S. will provide technical advice and a few staff for the agency. In 1946, a malaria outbreak across the Southern U.S. catalyzed the formation of what would eventually become the U.S. Centers for Disease Control and Prevention. Then in 2002, China's CDC began its operations just as an outbreak of Severe Acute Respiratory Syndrome, or SARS, took hold. Now, as the worst Ebola outbreak in history winds down, African health officials announced Monday they will partner with the U.S. to establish a continentwide African CDC. The idea for an African CDC first came to light at the 2013 African Union Special Summit on HIV and AIDS, Tuberculous and Malaria in Abuja, Nigeria. If Ebola wasn't the specific catalyst for forming the African CDC, the epidemic definitely sped up the timeline, U.S. health officials said Monday. The African CDC will initially set up shop in Addis Ababa, Ethiopia, which is home to the African Union. That should happen later this year. Soon after, five regional centers will open at undetermined locations across the continent. Field epidemiologists will staff each location and "will be responsible for disease surveillance, investigations, analysis and reporting trends and anomalies," the CDC said Monday in a statement. In the event of a health emergency — such as Ebola — the office in Addis Ababa will act as a central command post, organizing and deploying teams of medical workers. Some of that disease surveillance and emergency dispatching is already happening, says Dr. Thomas Kenyon, director of the U.S. CDC's Center for Global Health. The African CDC will "take advantage of existing structures to make it additive to what's already there," he tells NPR. In other words, the African CDC won't create an epidemiological infrastructure from the ground up. It doesn't need to. What it will do is link together agencies and laboratories in various countries that aren't always great at talking to each other. "Countries that might be weak in one diagnostic area can benefit from a neighbor who might have a lot of capability in that area," Kenyon says. To help make this happen, the U.S. CDC is donating both brainpower and troops on the ground. The Atlanta-based organization says it will provide "technical expertise" and help in the African CDC's long-term, strategic planning. It will also embed two public health leaders at the temporary headquarters in Addis Ababa and about 10 to 12 epidemiologists and support staff. The CDC already trains hundreds of African epidemiologists each year, Kenyon says, and the establishment of an African CDC will help coordinate that force. Of course, all of this comes at a cost. But how much funding it will take to get the African CDC off the ground isn't something either side is touting. Those figures are still being worked out, Kenyon says. But the 54 member states of the African Union will ultimately be responsible for funding the organization. "I think we're all going to have to do our part," Kenyon says, "but the leadership and real commitment will have to come from African governments themselves."